As swine producers strive toward fresh opportunities to enhance performance, efficiency and profitability, one of the most promising areas of innovation is animal nutrition. But while having the right nutrition consulting relationships is essential to ensure the most optimized approaches, it’s also increasingly critical that the strategies developed are custom tailored for each operation and are directed not from behind a desk miles away from the farm but rather from an in-the-barn level. It’s this precision, on-farm ‘slat-level solutions’ focus that has powered the steady progression and expanding customer base of Tracy, Minnesota, based IDEAL Animal Nutrition. 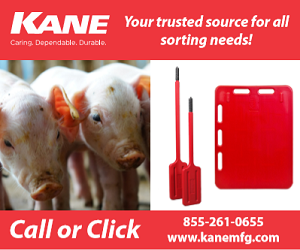 The company recently passed the milestone of four years in business and announced a significant expansion in capacity with the addition of swine nutritionist Simon Kern to its growing team led by owner and founder Dr. Jeff Knott. Swine nutritionist Knott founded IDEAL in 2014 following 10 years of industry experience as a specialist providing technical nutritional support to swine producers around the world. Knott has a B.S. in Animal Science from North Dakota State University, along with a M.S. and Ph.D. from the University of Minnesota in Animal Science (Swine Nutrition). Kern brings over five-years of industry experience in providing technical nutrition and production support to livestock producers and feed manufacturers. He has a B.S. and M.S. in Animal Science from South Dakota State University. After completing his formal education, Kern worked with a regional animal nutrition company where he served in multiple roles from feed formulation and technical service to product and customer solutions development. Bringing Kern to the team is the latest in a series of key developments for IDEAL. Among these, IDEAL has also established a research barn with numerous activities anchored by research manager Molly Renken, another South Dakota State University alumni who graduated in 2017 with a B.S. in Animal Science. In addition to a customer-focused, research-based, slat-level solutions approach, the IDEAL methodology includes a major emphasis on keeping at the leading-edge of nutritional technologies and products. The company offers expert nutritional advice and consulting, tailored nutrition programs, optimized feeding management and a variety of swine nutrition products to fit customer needs and milling capabilities. More information on IDEAL Animal Nutrition is available at www.idealanimalnutrition.com.